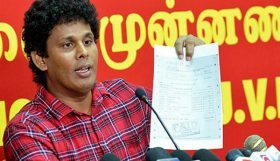 The President of Inter-Company Employees Union and the Member of the Central Committee of the JVP Wasantha Samarasinghe said members of more than 200 trade unions will storm the Central Bank over the alleged loss of a sum of Rs. 15 billion from the EPF through the Central Bank bond scam. He said this action was agreed by the representatives of trade unions who met in Colombo on Sunday. Mr. Samarasinghe said several reminders were sent to the Governor of the Central Bank asking him to take action regarding the loss to EPF due to purchase of 95% of Central Bank bonds by Perpetual Treasuries Company that has been involved in the bond scam according to COPE report. The Central Bank was given time till 18th January to respond but they have not received any favourable response from the Central Bank pointed out Mr. Samarasinghe. He said trade unions decided to storm the Central Bank premises and also to take strict trade union action if the Central Bank management fails to take corrective action before next Wednesday. Mr. Samarasinghe said the President, the Prime Minister, the Finance Minister and the Central Bank Governor had been requested to take action regarding the issue several times but there hadn’t been any favourable response. loss of tax on MPP vehicle purchases, whichis a Policy matter. Should take to legal course. Otherwise the image of the coutry will be further tarnished to add to financial losses. What is required is the law to be enforced not public shows. In South Korea, the people come onto the road every week demanding the resignation of of their President where her friend was involved in a vast money “Magadiyak”. JVP and out people are only now attempting to wake up on Central Bank scams but yet sleeping including the people’s party the JVP. What a shame. What a shame. Force Mahendran be arrested and kick Ranil out should have been the way since february 2015. But, they again pinched the EPF money as well in March 2016 and yet we are sleeping. Has ANURA KUMARA FINISHED BASHING THE RAJAPAKSHES ?????? WHY IS THE RATHU ALI PATIYA NOT LEADING AN IMPEACHMENT IN THE PARLIAMENT AND GETTING PEOPLE TO RISE DEMANDING THE ARREST OF MAHENDRAN & RESIGNATION OF RANIL. Anura Kumara, Vijitha herath what is the JVP deal with Ranil & the UNP. Follow the South Korean people and the Opposition and their example. why are we yet talking ? ?